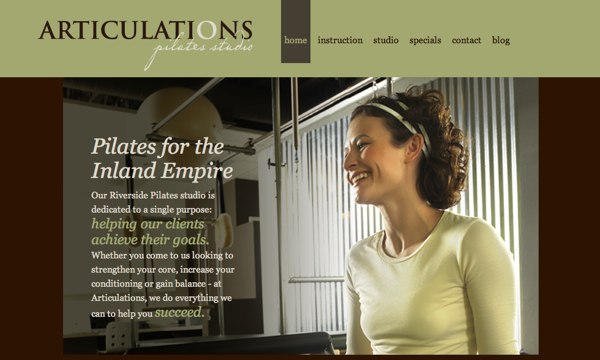 Friday, we launched a brand new site for one of our clients, Tricia Hill from Articulations Pilates Studio in Riverside. You should check it out. Beyond the fact that it’s beautiful and intuitive, there are a few neat things about Tricia’s site. It’s Easy To Update — Tricia’s a very hands-on business owner, willing to invest the time to regularly update her site. We think this is a good thing, so we built her site so that any time she wants to change content, or even add new content, she can do that. It Looks Better Than The Competition — Before we started the Articulations project, we did quite a bit of research on the competition. What we found was a lack of well-designed Pilates studio sites for studios of any-size – which means that Tricia has a site for a local studio that could standout on a national scale. It Uses Custom Photography — Tricia realized that she didn’t want her site to be filled with the same stock-photos as her competition, so at the project’s outset she had Mike (our photographer) out to the studio for a photo session. Ergo, every picture you see on her site is of her, her clients and her actual studio, something not too many local businesses can say. So, Tricia – you’ve been a pleasure to work with. Thanks for letting us build a site for you. And to the rest of you, take a look at the new Articulations site and let us know what you think.